Project Inspiration - Cute Umbrella Critters Quilts / Designs By JuJu Embroidery Blog! This entry was posted on August 14, 2018 by Julie Hesketh. Our Cute Umbrella Critters set is one of our favorite sets, and it’s also a customer favorite!! Our customers love to send in photos of the quilts they’ve created using this set, and we love to see the beautiful photos they send in. We had to put a blog post together featuring some of these amazing quilts customers made using our Cute Umbrella Critters set. We hope these photos will give you some inspiration for your next quilting project! Wow! 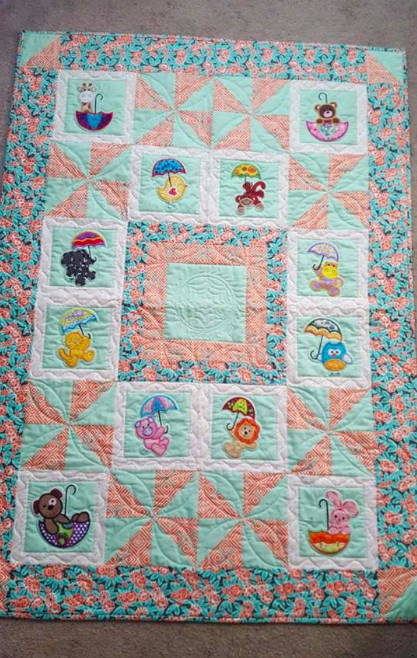 We love the way Dianne used our Cute Umbrella Critters Applique to create this beautiful quilt for her new granddaughter. 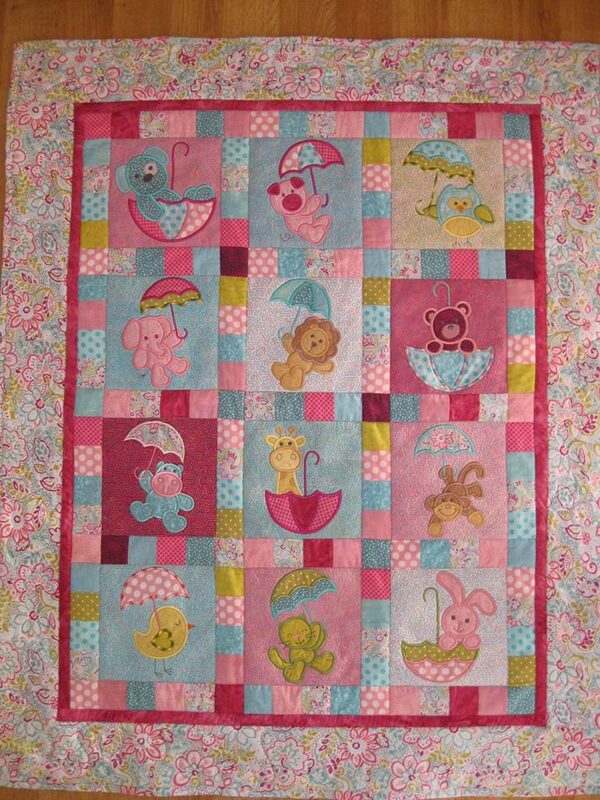 A quilt is the perfect gift for that little one in your life. 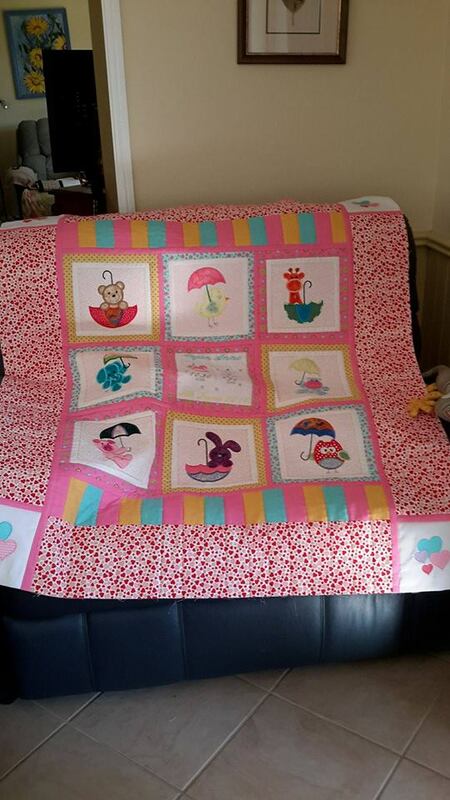 How adorable is this quilt by Dillman using our Cute Umbrella Critters Applique set? And how cute is the bib that Dillman made to go with it?? This would be the perfect baby shower gift! 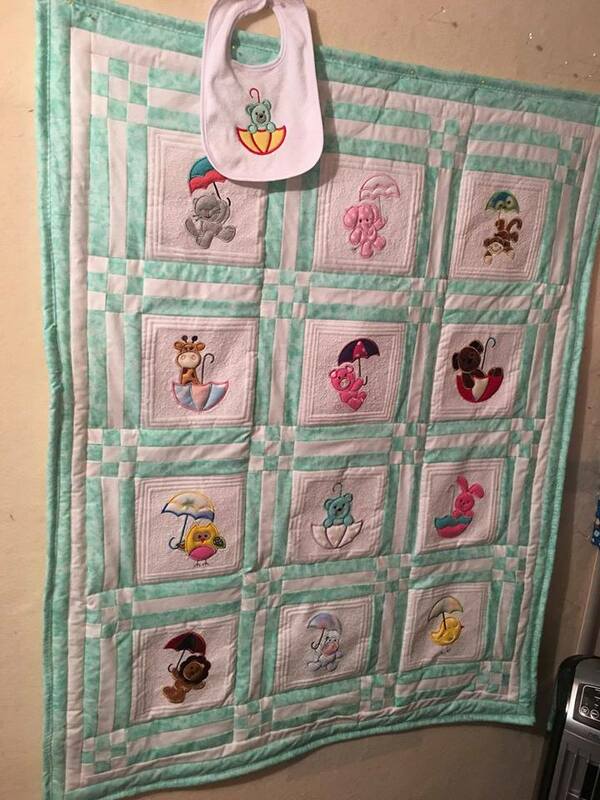 This quilt Jeanie made for her great nephew is just gorgeous! 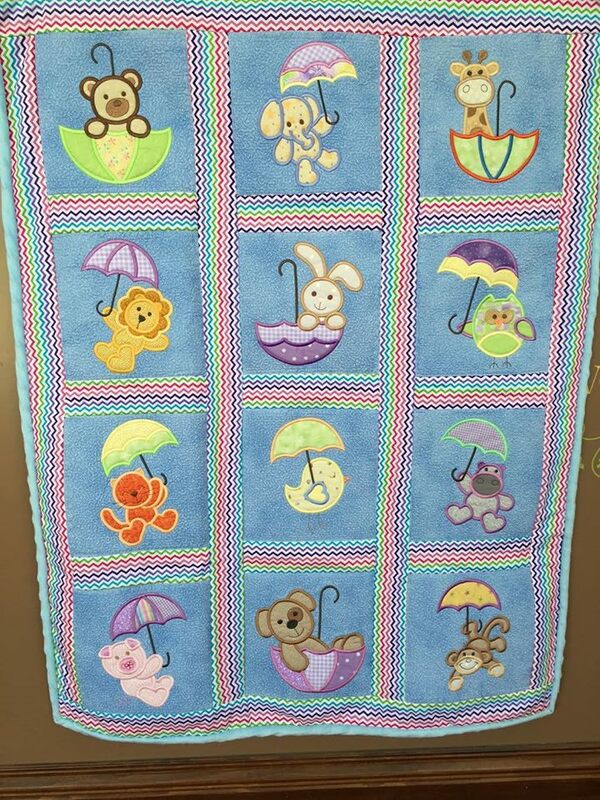 We love the bright colors she chose to use with our Cute Umbrella Critters Applique. 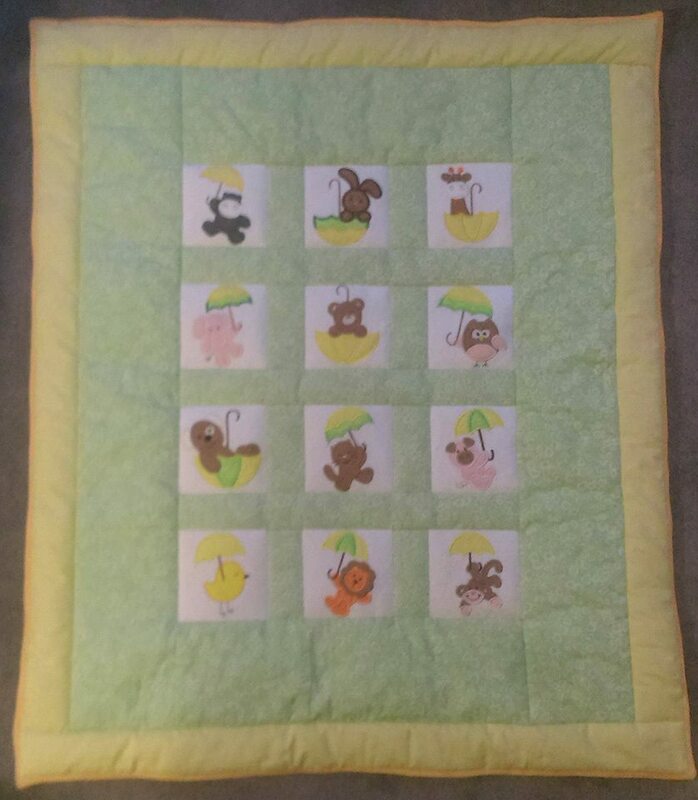 We hope Jeanie's quilt gives you some inspiration the next time you are choosing a color scheme for your baby projects! We can’t get enough of this quilt by Mary! We love all of the different colors and fabrics she chose to pair with our Cute Umbrella Critters set. We wish we could just take this adorable quilt home. Thanks for sharing this adorable project with us, Mary! 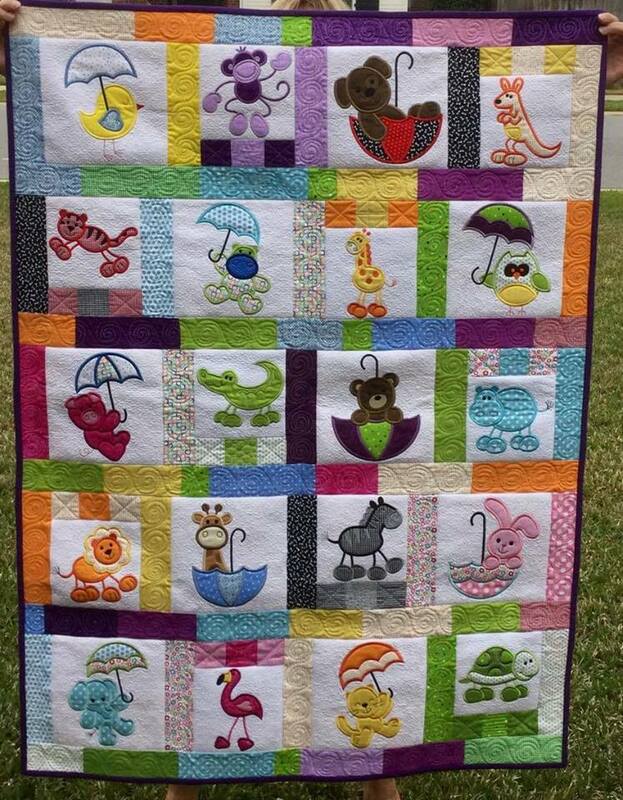 We love how Robyn used our Cute Umbrella Critters for this quilt! This quilt is giving us some serious baby project inspiration. The colors and patterns she chose are so fun! Thanks for sharing your project with us, Robyn! We are so glad Shell sent this photo in, and we can share it with so many people! 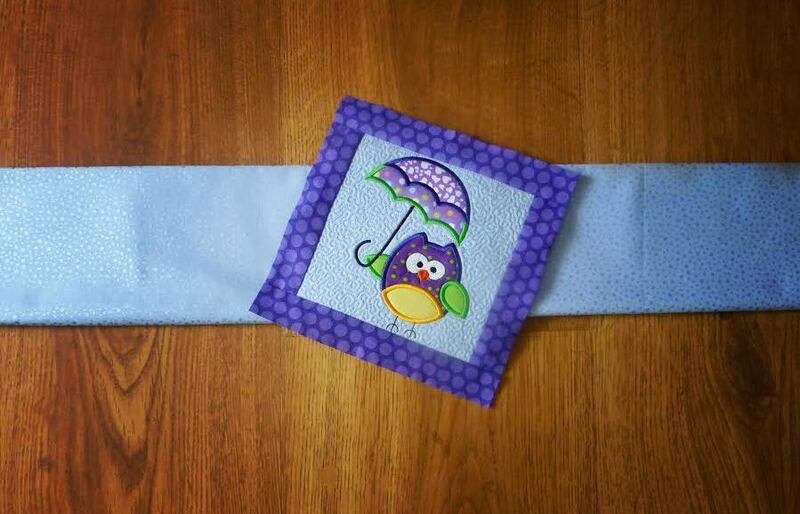 She used our Cute Umbrella Critters Applique in such a thoughtful, beautiful way. Thank you for sharing this project with us, Shell. What a beautiful way to give back. We can't wait to see what you've been working on. If you have a recent project you are proud of, please send us a picture or two! To submit projects for our showcase, or if you have any questions, please email: projects@designsbyjuju.com. Want The Sets You Saw?